James Burke is the founder and owner of Burke Pottery, a full-time ceramics studio, based in the hamlet of Millers Mills, New York. 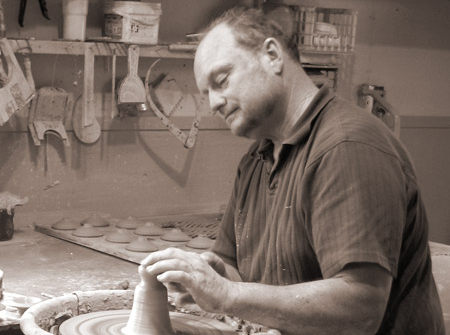 Jim first discovered his passion for traditional wheel-thrown pottery after following his wife to a beginner’s lesson. He continued in private study, and later earned a master’s degree in ceramics from James Madison University. After completing his master’s degree, he taught Art History and eventually joined as a partner in his family dairy farm; all while remaining active in the studio developing his style and techniques. In 2004, Jim established Burke Pottery. Here, he strives to combine functionality, quality, and a distinctive style, creating art that is wholly unique, but also suited for everyday use. In addition to his studio location, Jim’s work is available at several fine art galleries and shops throughout New York State, including Gallery 54 in Skaneateles, NY, The Artisan’s Guild on Main Street in Oneonta, NY, and Mohawk Valley Center for the Arts in Little Falls, NY. He is also a member of the Syracuse Ceramic Guild. Jim was the Visiting Artist at Cazenovia Artisans in 2017. Jim was interviewed by Mohawk Valley Living. See the feature below.